Norman Manley Intl. - Grantley Adams Intl. Piarco Intl. - Grantley Adams Intl. 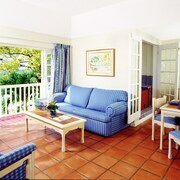 Nestled on the beach, this Holetown hotel is just steps from Sunset Crest Shopping Centre and Sandy Lane Beach. Paynes Bay Beach is 0.7 mi (1.2 km) away. Right on the beach with crystal clear water. Hotel was very clean and staff was wonderful. Love the rum punch! 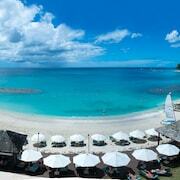 Nestled on the beach, this Holetown resort is within 1 mi (2 km) of Holetown Beach and Sandy Lane Beach. Paynes Bay Beach is 1.6 mi (2.6 km) away. 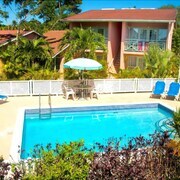 Situated in Holetown, this all-inclusive property is steps from Sunset Crest Shopping Centre and Sandy Lane Beach. 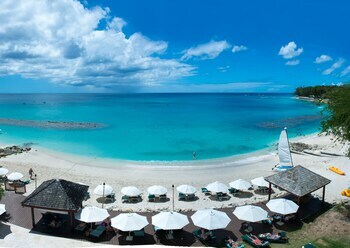 Paynes Bay Beach is 0.7 mi (1.1 km) away. The rooms where dated and a small. Which we had the largest room available. Not much of a beach area. Service was ok nothing exceptional. Event staff was great. Always wanted to see Holetown? Search out that cheaptastic flight already and get ready for your next cheap and cheerful vacation! 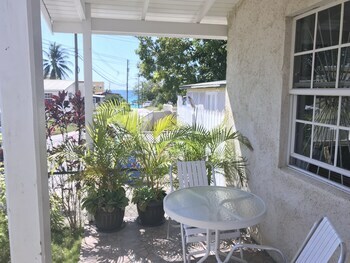 It's located about 6 miles north of Bridgetown, the national capital, and 6 miles north of Bridgetown. The population of this area of Barbados is nearly 1,000. Culture and art don't have to break the bank! At the Speightstown Mural you can select from a selection of free events — why not have a look at the program and pick your favorite? If you're eager to see attractions that won't empty your wallet, the Holetown Monument and the 3Ws Monument are a few of our top picks. Even if you're not particularly religious, there's something soothing about being in the presence of places of prayer. Naturally, St. Andrews Anglican Church, Sharon Moravian Church, St. James Parish Church and St. Peter Parish Church don't charge admission fees, but it'd be wise to inquire in advance if you're eager to take a peek inside. Looking for shapes in the clouds while sitting back on the shore is a relaxing way to spend an hour or two. Brighton Beach, Paradise Beach, Sandy Lane Beach and Mullins Beach are some glorious coastal areas to take your pick of. 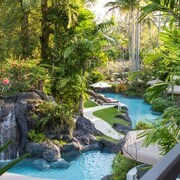 Eager to take a break from the constant hustle and bustle of modern life? Pull out your map and take the trip to Farley Hill National Park and Turner Hall's Woods. These are some of the region's leading natural sights. Don't allow any irrational fears of having to squeeze into a tiny, budget motel deter you from going on that trip. When you organize your travels with CheapTickets, you won't need to fork over too much money or give up quality. Think of all the fun things you could do with an additional $481. If you combine your flight and hotel bookings, that's how much you could save! And with access to 500 airline partners and around 500,000 properties across the globe, you have plenty of choice. When we say you'll score the hottest bargain, we mean it. It's a little thing we call our Price Guarantee. 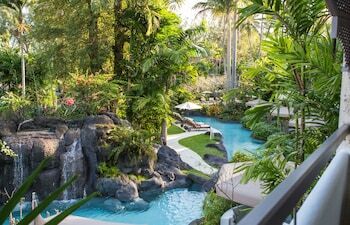 We'll meet the price and return the difference if you find a better bargain on that same vacation package within 48 hours of making your booking. There's nothing more satisfying than being rewarded for bagging a hot deal. Our rewards program lets you earn cash to use toward your next qualifying CheapTickets hotel booking. All you have to do is book your flights! So, what do you do now? Simply log in or sign up for free, join CheapCash, and you'll collect savings on all eligible bookings. You'll also be kept in the loop about extra-thrifty perks and bonus offers! So, cheapster — you don't have the patience for using public transportation, but you're looking for a cost-effective way to travel around Holetown, right? Why not explore the sights from the convenience of a rental car? It's way more comfortable than being crammed into a bus or train, and you'll get to control the tunes! Don't spend precious time trying to work out how to get a cab into the city. Pick up a car from the Grantley Adams International Airport area and save yourself the stress. Sixt and Ace are both in the vicinity. You don't have to worry about finding a cheap and cheerful place to lay your head. 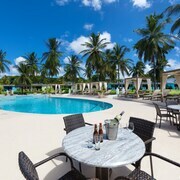 CheapTickets has 67 hotels in Holetown. Lock in your room now for all the best value deals and amenities. 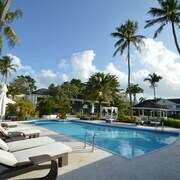 The Saint Peter's Bay and The House by Elegant Hotels - Adults Only are excellent accommodation choices here.